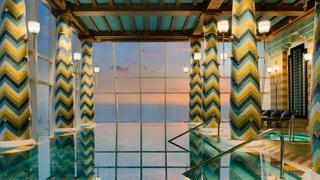 Housed in the Burj Al Arab, the spa boasts supreme views of the city. 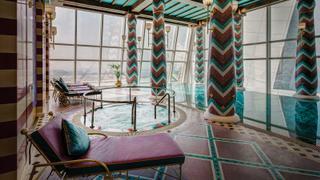 Situated 150 metres above the Arabian Gulf, this vast spa sprawls over two floors and is as decadent as Burj Al Arab, the hotel it is housed within. Shaped like a billowing sail, the resort sits on its own man-made island 280 metres from the mainland. Guests wishing to enter this bastion of luxury must first cross the curving causeway to enter its gold-column-flanked atrium. Having opened at the turn of the millennium, the Burj Al Arab is by no means a newcomer to Dubai, but superyachts are a relatively recent addition to the party. An increasing number have been spotted in the UAE, partly drawn by the Abu Dhabi Grand Prix. And Dubai Harbour is in the process of being transformed into a 1,400-berth marina for vessels up to 85 metres. Indulge yourself in the two-hour Wave Journey while jet skis carve wakes in the bay below. The treatment consists of an awakening rub to leave your skin baby-smooth, followed by a Swedish massage. It concludes with an organic warming wrap designed to banish wrinkles and support detoxification. For couples, the spa also offers the Romantic Moonlight Swim package, which is a joint massage, followed by a private moonlight swim in the infinity pool. 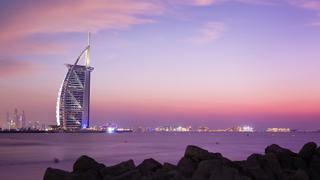 The Burj Al Arab’s nearest neighbour, the Jumeirah Beach Hotel, has a marina for yachts up to 60 metres.